By Md. Towhid Hossain, SVP, IRMD, SIBL, HO. One of the most important functions of a bank is to employ its fund by way of Investments/loans and advances to its customers and a bank’s strength depends considerably on the quality of its Investments/loans and advances. Though the banks are now expected to lay greater emphasis on the purpose for which the customer needs Investments/loans and advances rather than security he can afford to give, security continues to be one of the most important factors which determine to a significant extent the banker’s willingness to invest/lend money. Most of the Investments/loans and advances granted by banks are secured against varied types of assets.Banks take/borrow money/fund/deposit from the people without security. Banks don’t usually invest/deploy money/fund/deposit to the people without security. A security is an interest or a right in property given to the bank/FI/creditor/investor to convert it into cash in case the Investment customer/ debtor fails to meet the principal and profit/charge/ interest on Investment/ loan. The bankers hold various kinds of securities as a cover of investment exposures/advances to their customers. The securities offered to the banks vary in qualities. Security is obtained as a line of last defense to fall back upon. It is meant to be an insurance against emergency. Basically, there are two types of securities available to Banks to secure an Investment/ loan. They are Primary security and Collateral security. 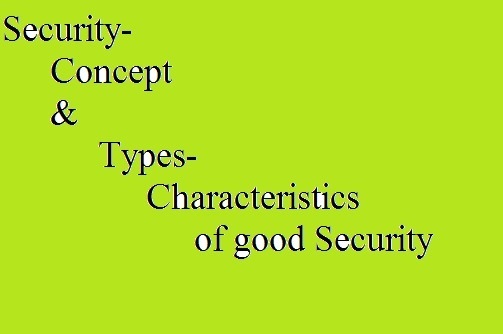 Primary Security: It refers to the asset directly created out of Bank finance. For example, where a Bank finances the purchase of a home, the home is the primary security. In the same way, a car purchased with the help of a Bank Investment/loan is the primary security for that loan. Further in the case of working capital Investment/loan, “stock and book debts” is considered as primary security and in case of trading, it is trading stock. Bank creates a charge against this primary security, to secure its Investment/loan. This charge gives the Bank the legal authority to dispose of the asset, and apply the proceeds therefrom to the Investment/loan amount in default. Collateral Security: It refers to certain additional security obtained by the Bank to secure the Investment/loan. For example, say, a Bank has financed the purchase of rice for trading. This stock of rice would be the primary security for the Investment/loan. In addition, the Bank may obtain collateral security in the form of residential flat owned by the proprietor, as additional security. This will guard Bank’s interests in the event of the primary security not having sufficient value to liquidate the Investment/loan. Sometimes, on account of adverse market conditions, the value of the primary security gets eroded, exposing the Bank to a higher risk than it had originally dealt for. Support (Guarantee): Additionally, Investment/loan can also be secured with the help of personal security of other individual/company/ borrower himself. It happens through charging of guarantor’s Intangible assets (Goodwill), if above two securities fails to cover the exposures. Margin: In case of non-funded business, i.e payment undertaking on behalf of the client[LC, BG etc. ], the bank usually takes cash in full or part to mitigate the inherent risk; which is called margin. Easy to Value: The market value of the security should be easy to determine in the market. The value of house provided as security should be easily determined; further the value of the security should be stable over the period and not fluctuate. Easy to Realize: The security should also be marketable or easily to sale. The lending institution should be able to dispose of the security without incurring additional cost. The security should also be easy to liquidate, concert to cash in little time without loss of value. Easy to Take: A good security should enable the lending institution to acquire an interest or charge over it without delay and additional costs. There should be no legal encumbrances, disputes on the security. The title deed or ownership of the security should be in favor of the borrower and there should be no outstanding dispute over it. Other components of easy to take should be ease to own legal or take physically. Valuation of movable property: The purchased price/cost price/market price/depreciated price whichever is lower. In case of share/security: The face value/Market values whichever is lower. Valuation of immovable property: The valuation of land and house property would depend upon a number of factors including its situation, tenure of land under the building (whether freehold or leasehold), rent, taxes and tenancy laws. A vacant building in a prominent locality in a big city will get a much higher price than it would bring if occupied by a tenants paying old rents which can’t be legally increased. The tenants can’t also be evicted except through prolonged litigation, the result of which may be uncertain. Bankers are not experts in valuing immovable properties. So, the services of professional surveyor are employed to determine the value of immovable property. In case of plant/machinery: Invoice value/depreciated value considered. The services of special surveyor have to be requisitioned in addition to examining the relative original invoices. One important point to remember is that the value for the purpose of a bank advance is not the present cost of construction of the building or the prevailing price of the land under it, both of which may be very high, but the value under a forced sale.